If you've checked the 2012 Hendon/IPMS Barnet thread you'd have seen that the SIG display surpassed itself this year, and that I appear to have gained a stalker. Sadly it wasn't the delightful bit of tall that sashayed past the stand on several occasions (and which caused OGL to turn his head, owl like, through some 350 degrees anticlockwise! ), but you can't win them all I suppose. Amongst my offerings was a Gnat F2 that had first appeared at Cosford, albeit not in its final guise; that's posted up on the Gnat theme build thread. A brand new effort that was let out to play owed its origins to Cosford, but was built for Hendon. The Dewoitine-Vickers DV521 Spitfire I is meant to be a product of Anglo-French collaborative builds that emerged in the mid-30s (I'm tempted to have a go at a Hawker-Morane Ouragan at some stage - whether it will be MS406 or Hurricane based only time will tell). 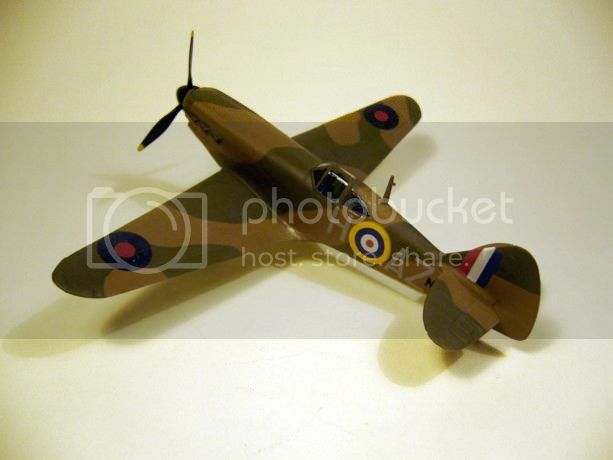 Now there's a grain of truth in the DV521 designation - a D521 project did exist and was intended to be a Merlin-powered D520 - and to add a further grain of truth of course the model is finished in the old Airfix Spitfire I's 1940 markings. 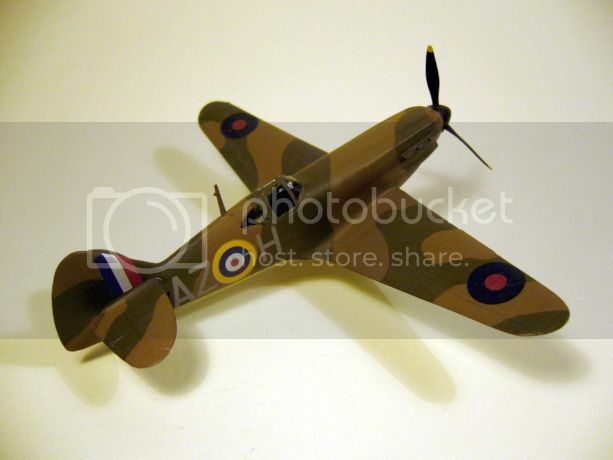 I say it's origins lie in the Cosford show - OGL needed a Spitfire for 'Operation Cosford' and I came close to obliging. Thankfully Radish stepped into the breach in his own inimitable style and I didn't have to a) buy, and b) build anything (thankfully). Still inspired by the idea of a D520 masquerading as a Spitfire, I snapped up a SMER boxing of the old Heller D520 for less than half the price of the HobbyBoss D520 I'd have bought had the build been needed for Cosford. 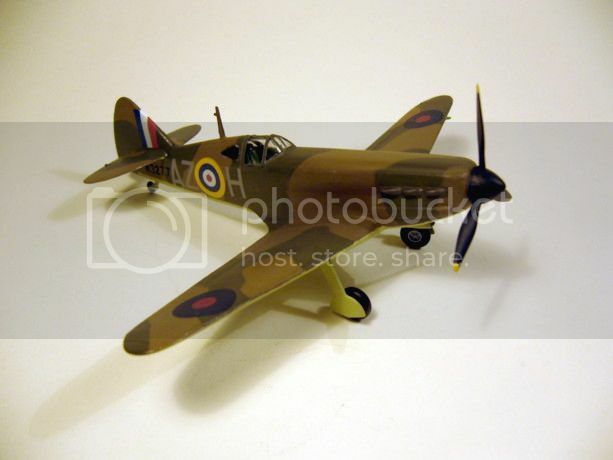 The build was quite a quick one, the only changes to the kit (apart from the obvious paint job) were the addition of an old Airfix Spitfire I prop, tailplane and tailwheel. Decals, part from the wing roundels, all came from the Airfix kit. Looking back I wish I'd replace the fin and rudder with Spitfire items, but that would have extended the build and hey, it's a hobby! That may have been a 'quickie' but it sure looks great! When I saw it in the Hendon pics I thought it was a D520, and then I looked again and thought it wasn't, and so it went on until your post clarified matters. I like it. Make a hell of a sport plane too. 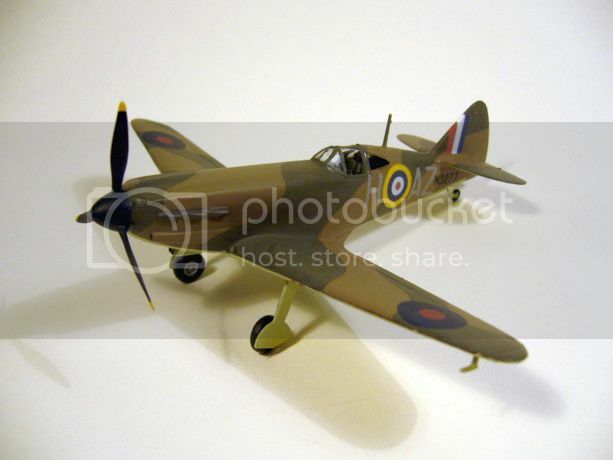 Now, what I don't have time for is building one with the front end of a Spitfire attached (engine & cowling) plus radiators & the Spit's Malcolm hood replacing the French canopy. Little Fish sadly passed away while I was have a 'paid-for-by-the-TV-licence-payer chortle with Shatner at the HIGNFY recording. The highs and lows of life! The ritual scrubbing of the Corsair continues, more on that thread to follow. No other modelling this week though. Not much modelling done recently, other than the 'Little Corsair' recycle and slowly but surely building up an interior for my Airfix Val. Acquired a pair of Airfix F.22 Spits this morning, plus some Aeroclub stuff from TAHS, for a mix of real world and whif projects (although one of the latter will be a Hawker P.1009 Sea Typhoon). Only seen one built and that was a few years ago over at a show near young Nick's neck of the woods. Don't hold your breath for the Sea Typhoon Chris! It's a way down the project list, but if it moves up it you'll be the first to know. Also the chopping that's needed for that model will actually throw up bits for some other ideas I have festering away, so it might not be a bad idea to make a start before this year's out. But first, the Little Corsair continues to make progress, and the Val's interior is slowly coming along. I'm quite enjoying building up the cockpit interior. nothing fancy, just enough to add a little interest to a rather empty space. Then I really must return to my Battle and the long drawn out Boscombe Down Phantom FG1. All three are real worlders. A bit further down the line are some whifs I've been tinkering with for Telford, so need to give them some attention. And after that I think some Spitfires are long overdue; and Xtrakit XII that's been started (OK, some bits have been painted), an new Airfix I and then a pair of the new Airfix 22s (one as a 22 to replace my Pegasus 22, the other a 24) and a Legato 22/24 which, having languished in the stash for many years, will be finished as a Seafire 46. Each of the Spitfires and the Seafire will be real worlders and I'll post pics of the completed items in this thread in due course. But don't worry playmates, I've so many whif ideas to bring to fruition my head feels as though it might just go pop. But then again, i think we're all that way inclined! Hardly any modelling the last few weeks - too distracted by Stratford Sports Day Parts 1 and 2, a week in Sweden, etc, but making the effort to get back into the groove this last day or two. So at long last I'm getting back into the modelling groove after a summer of distraction. Progress on the Battle and the Val continues at a glacial pace, but I've two new whifs on the go and two that were put to one side a yearago have been resurrected. Will they all be ready in time for Telford, though? I hope so - although with a two week holiday in the States between now and a few days before SMW, I wouldn't bet on it! Well showtime (i.e. SMW) beckons. With barely a month and a half to go I'm sure I'm not the only one who's thinking there's not enough time to get new builds for Telford completed in time. In my case time is running out quite quickly as I'm off to Florida for a fortnight before October's out - and not leaving to come home until the day of the US Presidential Election! Get home early 7 November, work the 8th (and a commitment in the evening), so basically ! As ever I'm overstretching myself - I've 4 currently on the go for SMW. One is in the painting/decorating stage, one is almost built but will obviously need painting and markings sorted, while the other two are very much still in the construction stage. If I can spend an hour a night on the batch I may be done in time. I'f I am successful that means I'll have finished 10 models this year - I think this is a 'personal best' - with hopefully time to finish the Val and the Battle. I would like to get them done before the years is out - I've been working on them on and off all year! I know what I want to build net so I must show a bit more discipline in drawing up and applying my 2013 plan. OK, the force has been with me the last couple of days! The Telford Four is still four, but one is nearly complete, another is definitely catching up and the other two....well they're progressing but are still in the PSR phase. Hope I can maintain the momentum going, it would be a shame to stall and stumble now. Number 1 is definitely almost done. Big push tomorrow should mean it'll be finished Saturday. Number two essentially built, PSRed ajd ready to paint. Primer tonight. Number three has almost caught up with number two. A bit more PSR but essentially built with painting to follow. Number four is the concern. Building is almost done but there's a fair amount of PSR required. Thankfulkly the paint job is a simple affair, so maybe I'll be able to catch up then. I need to get these done by Sunday 21 October because of a holiday committment that doesn't see me back in the country until 7 November. Work and evening committment 8 November, pre-position for Telford after work on the 9th. So still 'aaargh' basically! My own fault for being too distracted by the Olympics over the summer. Well I say summer, I mean 'less wet season'.